Edinburgh Capitals coach Dmitri Khristich said it was a frustrating weekend for him as his team took a point from their two games. A penalty shots loss at Dundee Stars on Saturday in the Challenge Cup was followed up with a 3-1 home loss to Braehead Clan in their league opener. And Khristich was particularly concerned about his defensive areas. "Obviously the outcome (from the weekend) is not what we're looking for," Caps coach Khristich said. "But, we'll have to work on powerplays and defending in front of our net. "It's been a frustrating couple of days and I don't like to lose. The two goals we lost in the second period of the Braehead game were particularly disappointing. "They showed us how to score by stepping into from the middle and firing a nice shot. Every goal counts and it doesn't have to be pretty. "We have to work on our defensive zone and in front of the net and we will practice every day to try and fix it." 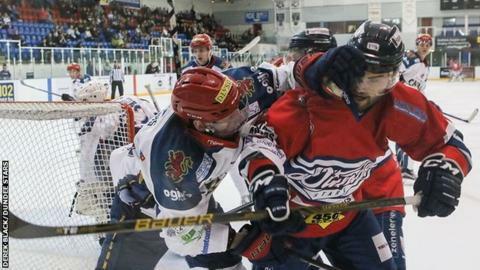 Saturday ended in heartache for them, taking a lead with three minutes to play, but eventually losing out 4-3 to Dundee Stars after penalty shots. Juris Upitis left Stars goalie Travis Fullerton beaten with a shot to put the Caps ahead before Igor Valeyev added a second. Omar Pacha's side regrouped and came out in the second period, getting on the board as Patrick Lee and Tyler Brickler struck to level the game. The Caps thought they did enough with a goal from Sergei Banashkov late on, but they had no sooner finished celebrating when Emerson Hyrnyk fired a late equaliser for Dundee. Once overtime couldn't separate them, Marc-Olivier Mimar made the difference in penalty shots to put Stars top of Group B in the Challenge Cup in their only game of the weekend. The Caps returned to Murrayfield on Sunday, but couldn't find a way past Braehead Clan, who picked up a four-point weekend from their two games. Tyler Scofield, Brendan Brooks and Landon Oslanski had the Clan three up without reply by the end of the second period. Although Edinburgh pulled one back through Sergei Banashkov late on, it was all they could muster as Khristich's weekend didn't get any better. For Clan, it was maximum points from two games after a weekend that saw them come away with nothing last week. Their 5-3 success over Nottingham Panthers was their first league win of the season and against a team that has won three out of four in European competition. Panthers went in front through Evan Mosey which was cancelled out by Mike Embach for the Clan. Josh Shalla had restored the home side's lead by the end of the first. Matt Haywood pulled Braehead level again before John Tripp's side started to get a grip of the game, with Brendan Brooks adding the go-ahead goal. This was followed by Adam Brace scoring from close range after Panthers goalie Garnett failed to deal with Christoffer Bjorklund's shot. Panthers hit back early in the third as Ollie Betteridge closed the gap to one, but Brooks with his second confirmed the points for the travelling Clan. Fife Flyers had only one game this weekend and took both points in a 2-0 shutout victory over Coventry Blaze in their league opener. Coventry's Danick Paquette was ejected from the game as tensions began to boil over towards the end of the second period with the game goalless. Fife were handed a seven-minute powerplay as a result and promptly took advantage as Danick Gauthier tipped in Peter LeBlanc's effort for the opener. Liam Heelis added a second early in the third to complete the win for the Kirkcaldy side, who enjoyed Sunday night off.